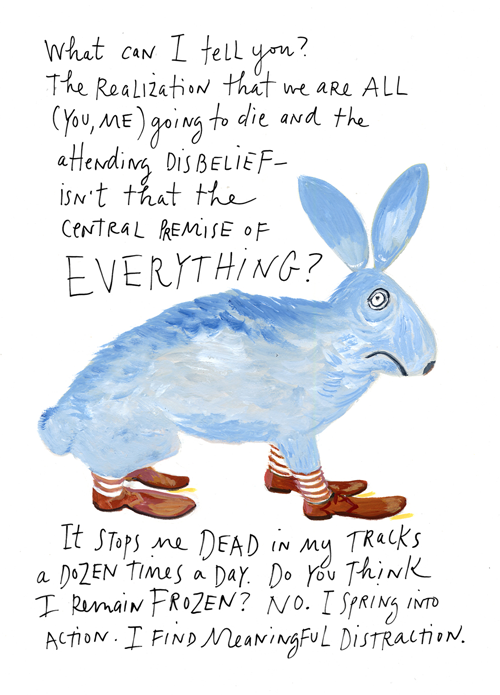 I have just been re-acquainting myself with Maira Kalman’s fabulously funny illustrations and ‘stream of consciousness’ words. Amazing how much you both forget and are familiar with when you really start looking at something, no? And do go and look at her website: Maira Kalman where there is a short bio as well as a lot of her work to see. She has an amazing body of varied work including food, fashion, design and so much more. Everything she does is more about smiling and query than laugh out loud funny – no traditional stand-up comedy happening here. I find the random digression of her thoughts and meanderings fascinating. We all do it, of course, but there is an art in being able to articulate and illustrate as you go … that, we do not all do! I hope you like her and, if you do, spread the word. Inspirational.